The Core Strategy, part of the Local Development Framework (LDF) for Wandsworth borough, was submitted to the Secretary of State in March and is now being examined by an independent Planning Inspector. Initial deadline for submission was set to September 4th, but with regards to presentations and comments the inspector raised two main concerns (lack of definition for “tall” buildings zones, and affordable accommodation) and asked the Council to make another round of consultation. 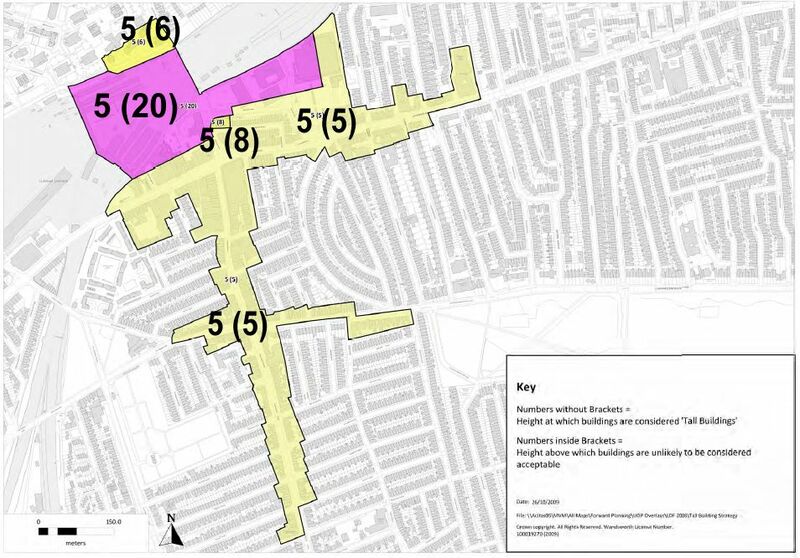 Wandsworth Borough Council (WBC) has produced a document called Sites Specific Allocation. It will go before the Transport Committee this month and should be followed by a consultation period up to February 2010. It will be reviewed by the inspector in due course, probably in 2011. Sites Specific Allocations: from p154 it display maps with colours of preferable heights. The Council has released a Core Strategy Post Submission Version Sustainability Appraisal, September 2009 (download on WBC website). On page 198 (Policy PL13 – Clapham Junction and the adjoining area) of this document they made two amendments following the Inspector’s concerns that the current policy did not include specific reference to account being taken of the historic context when assessing applications for tall buildings. The minor wording change makes it very clear that proposals for tall buildings will only be acceptable in Central Wandsworth and the Wandle Delta if they can justify themselves in terms of the criteria in policy IS3 (including reference to historic context). Taller buildings could not only help deliver significant regeneration benefits but also give a visual focus to the town centre, subject to the qualifications set out in Policy IS3 and the criteria based policy on tall buildings to be included in the Development Management Policies Document. Albeit still referring to the fact that taller building “could give a visual focus to the town centre“, they also amended Clause e) and removed reference to the Clapham Junction Station site being potentially suitable for tall buildings, following concerns from the Inspector that specific reference to sites within these broad areas is not appropriate at Core Strategy stage. Taller buildings in this location could be justified due to the proximity of Clapham Junction station and its accessibility to high frequency public transport. On the picture produced in the Urban Design Study, we can see that the proposed redevelopment of Clapham Junction station area with the twin 42-storey towers would have been very unlikely as it fixes the limit to 20 stories; and the 16-storey hotel proposed for the bottom of Mossbury Road would have also been considered from start as well above the limit of 8 stories. Numbers without brackets: height at which buildings are considered tall buildings. Numbers inside brackets: height above which buildings are unlikely to be considered acceptable. The picture shows also that any building above 4 stories will be considered as a “tall” building in Clapham Junction area. 2.39 The urban characterisation of Clapham Junction town centre indicates that its prevailing building height is around four storeys, and the only buildings that punctuate the skyline are those of Civic, cultural and retail importance, notably Debenhams (formerly Arding and Hobbs), a flagship Department store, the Grand Theatre and the former Parcel office at the station. Accordingly any building of five storeys and above 20 would be noticeable above the prevailing height within the town centre. Because of the need to protect the essential character of the buildings that define the main shopping streets, applications for development of 5 storeys and above will be subject to the criteria of the tall buildings policy. Throughout most of the town centre (and conservation area), applications for buildings of more than five storeys will generally be unacceptable, and will only be considered in exceptional circumstances. 2.41 Tall buildings in this location could appropriately form part of a mixed use development, though it is recognised that the tall buildings themselves are most likely to be residential-led, as the demand for office space in the town centre is limited. Applications for buildings of more than 20 storeys will generally be unacceptable, and will only be considered in exceptional circumstances. 2.42 The guiding principles for the ASDA, Boots and LIDL sites, are to secure a new retail shopping street with frontages on to the street of around four storeys, consistent with the character and grain of the town centre and conservation area. […] Tall buildings would only be acceptable towards the railway on this site. 2.44 The site of 155 Falcon Road is occupied by a 5 storey mixed use building. A tall building in this location would have a demonstrable effect on the adjoining area […]. Accordingly applications for buildings of more than 8 storeys will generally be unacceptable, and will only be considered in exceptional circumstances. Entry filed under: Clapham Junction, Tall building policy. In the press	No secondary school in Clapham Junction area. Join the campaign!